After losing their first two games of the season, the Boston Celtics have now won 10 games in a row after defeating the Los Angeles Lakers 107-96 last night to improve to 10-2, which is not only the best record in the Eastern Conference, but the best record overall in the NBA through the first 12 games. The Celtics have seven different players averaging at least nine points per game and currently rank first in defensive rating. 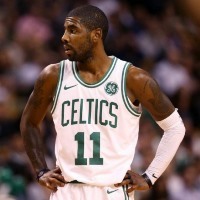 In offense, they are being led by an impressive Kyrie Irving that is having a huge impact and has helped mitigate the loss of All-Star forward Gordon Heyward, for the rest of the season. Kyrie is thriving in a system where he’s been a key component in a ball-movement heavy offense as he’s been relied upon in crunch time to do some stuff in isolation. Despite this, he’s not as ball dominant as in Cleveland as he shares the ball more now that he is in a motion-based system that moves the ball all over the court. An area that Irving has improved drastically, however, is his defense. He currently ranks fourth in steals per game (2.08), but he’s fifth in the league in deflections per game (3.5), ranking above players such as the Minnesota Timberwolves’ Jimmy Butler, 2017 Defensive Player of the Year Draymond Green of the Golden State Warriors and the Philadelphia Sixers’ Robert Covington who finished fourth in Defensive Player of the Year voting last year. For someone who during his days in Cleveland was called a defensive liability, it’s remarkable to see this kind of improvement this quickly and early in the season. The fact that the Celtics currently have the best defense in the league is a direct result of Irving’s dramatical improvement. An improvement that is probably fueled by the desire to silence those who criticized his defensive skills. The Celtics have one of the youngest teams in the league and the rotation players have so far done a remarkable job to also help make up for the loss of Heyward since the first game of the season. The Celtics are relying on first, second and third year players to play big rotation minutes and put an all-around effort defensively that limits their opponents’ efficiency. The Celtics right now are a fun team to watch and play for. This team has the depth and the personnel to go head-to-head with any team in the East and we should have a better idea on how far they can go in the playoffs by late February or early March.